TRACY MORGAN IS BACK - FIST FIGHT! Tracy Morgan is arguably one of the funniest comedians in Hollywood and we can all appreciate his comeback from his nearly fatal accident in 2014. With his upcoming appearance in Warner Bros film FIST FIGHT on the horizon, his first major motion picture since his accident, we put together a list of five times we really LOVED Tracy Morgan. 1. Tracy's SNL comeback - Just under a year and a half after his accident, Tracy returned to SNL to host one of the funniest episodes in his career. He brought back many of his unforgettable characters and reminded everyone why we all loved his SNL stint. 2. Tracy's 2016 Academy Awards Appearance - With all of the media attention on The Oscars not representing enough diversity, Tracy Morgan decided to be a part of one of the funniest skits from last year's Oscars show. Starring as the lead in The Danish Girl - Tracy surprised everyone with his silly take on the film. 3. Tracy's ability to be honest with the world - In one of his first TV interviews after his car crash, Tracy completely opened up on The Today Show and broke down in tears discussing his situation and thankfulness to still be here. 5. Tracy's take on life - Tracy once said, "I don't take any relationship for granted and I won't ever again. I just enjoy life." Synopsis: On the last day of the year, mild-mannered high school English teacher Andy Campbell (Charlie Day) is trying his best to keep it together amidst senior pranks, a dysfunctional administration and budget cuts that put jobs on the line. 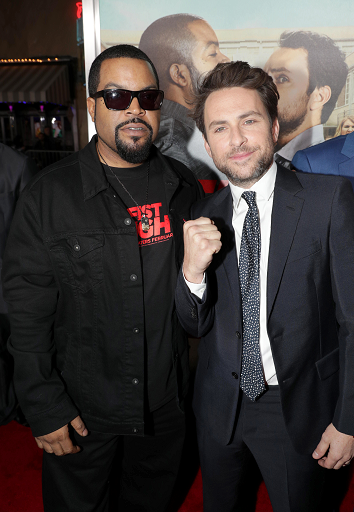 But things go from bad to worse when he accidentally crosses his much tougher and deeply feared colleague, Ron Strickland (Ice Cube), who challenges Campbell to an old-fashioned throw down after school. News of the fight spreads like wildfire and ends up becoming the very thing this school, and Campbell, needed. Richie Keen directs from a screenplay by Van Robichaux & Evan Susser (Funny or Die’s “What’s Going On? With Mike Mitchell”), story by Van Robichaux & Evan Susser and Max Greenfield. “Fist Fight” is produced by Shawn Levy, Max Greenfield, John Rickard, and Dan Cohen. Serving as executive producers are Toby Emmerich, Richard Brener, Samuel J. Brown, Dave Neustadter, Charlie Day, Ice Cube, Marty P. Ewing, Billy Rosenberg, and Bruce Berman.